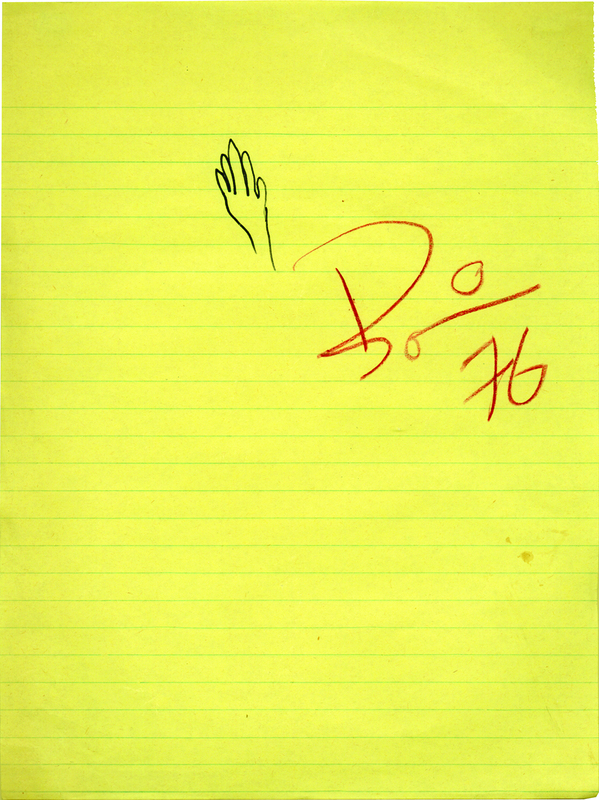 “Self Portrait ’76” — a treasured keepsake from David Bowie as he worked on Station To Station. In our last conversation, I read him back some of his quotes from the “wild years in LA” period. Looking back was not his game, but he listened patiently. Some of the quotes were spectacularly profound, but Bowie took no ownership. “It really represents the morbid and misdirected enthusiasm of a young man with too much time on his hands and too many grams of PCP, amphetamine or cocaine or maybe all three in my system, really.” He explained he was happy he left Los Angeles, went to Germany for his next phase, and slowly saved his own life. “That whole time is a blur topped with chronic anxiety… I could have easily died.” He once doodled the accompanying drawing on a paper while I interviewed him. He left the paper behind and I asked him to sign it. 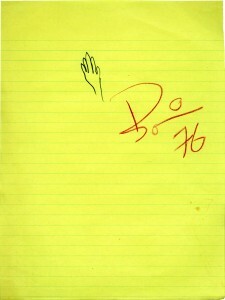 “It’s a self-portrait,” he said, and applied his signature. Over the years I’ve come to interpret the drawing as a tiny cry for help… a cry he answered himself with the subsequent trip to Berlin and an entire lifestyle change. Bowie turned that dark period on it’s head, and went on to supply many more generations of fans with music and art and soul and inspiration. He careened beautifully into the future… where he will always be. Piotrek czy to nie jest okladka Twojej ksiazki o pisaniu? Thank you for sharing this Mr. Crowe! How lucky you were to spend that time with him and we are fortunate to have you to share it with us. Thank you. There was a quote of his during an interview with you about being in a high story and a body dropping from a window above. Do you remember it? Incendiary info Cameron Crowe. You’re “almost famous”. Thank you for posting this. It is a wonderful story. Thanks Cameron. Made a sad day a little easier. A beautiful tribute Cameron. Thank you. U can write . Thanks? Mahalo for sharing Cameron. Bowie was as original as he was talented. R.I.P. I needed this today. Thank you . best article about bowie out there today. That was lovely. Thank you for sharing your thoughts, remembrance, and his “self portrait”. Even though the Bowie sequence might have taken up around a minute of screen time in “Untitled,” that sequence in the extended cut, I thought, really nailed Bowie to me, tying him into the theme and structure of the film’s story. The comedy of Nick Swardson’s “Insane Bowie Fan,” who starts off dismissive of Bowie when trying to analyze Ziggy Stardust, looking masculine and secure in his posture, as if what he’s speaking is assuredly grounded in truth, before Bowie appears and all of a sudden Swardson is screaming at the top of his lungs, jumping and waiving his arms in an effeminate manner, switching from would-be critic to would-be Band Aid, from masculine to feminine–is not only a great laugh but also captures the duality of Bowie and the essence of the movie at the same time. And that it’s all done to a song of Lou Reed’s as sung by Bowie, curtailing the discussion that sort of cements the bond between William and Lester earlier, is just a sly kicker. Nice one, Joseph. You don’t miss much. Beatiful tribute Mr Crowe.. He got to characterize Tesla. And it was sublime. An icon playing as another icon. Ah Cameron Crowe, I read you during those years, with such envy!You were a hero, second to Mr. Bowie, as I wanted to chronicle his genius.On a winter afternoon after school in 1973, I walked into a record shop in Wausau, Wi, a gangly, awkward teenaged girl and walked out — I’ll risk the cliché — never the same again. Flipping through albums, I saw a boy like none I’d ever seen. Strange, alien even, but beautiful. I stared at the record, not knowing exactly what I was feeling but was absolutely compelled to buy it. The next week, I returned and found another album cover that captivated me, and on the credits it said David Bowie produced it. Lou Reed’s “Transformer”. By 1974, I was lying to my parents saying I was sleeping over at my girlfriend’s to go to Milwaukee four hours away to see Bowie’s Diamond Dogs concert. I reviewed it for my school paper using the byline “Twig the Wonder Kid” from the line in the song Drive-in Saturday, “she sighed like Twig the Wonder Kid.” In 1975 I spent the summer in London and returned with velvet, glitter and platforms. Now heaven is enjoying better music than the choir of angels. Kind of you to generously share that. He needs a movie. You need to make it when the time is right. God bless. My first ever exposure to David Bowie: You showed me a vinyl copy of “Changes” back in high school and told me “This guy is going to be HUGE.” You called it, my friend. My first instinct upon hearing of David Bowie’s death was to re-watch ALMOST FAMOUS. Like Bowie it captured a time and a place perfectly. These are sad days in the wake of his passing. ALMOST FAMOUS will help me through it. completely remember!! have my note pad! !